Today, Cincinnati City Council will vote on whether to approve roughly $2.6 million in City funding for the streetcar project. This financial commitment from the City is not only important to help keep the project moving forward, but also to help the project win future allocations of state and federal grants. 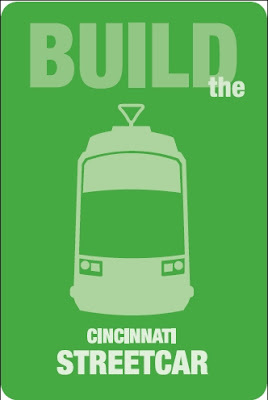 The Cincinnati Streetcar came away empty handed when the first round of TIGER funds were awarded, and one of the primary reasons for this was the lack of a local financial commitment to the project. The Feds, like any investor, like to know that they are investing in a project that is supported financially by those asking for the money. They like to know that the local community has a financial stake in the project and want to see it succeed. If you are able, attending the meeting today at City Hall would be extremely helpful. There needs to be a majority in favor of approving these funds to make it happen, and so far there are four firm yes votes (Quinlivan, Cole, Qualls, Thomas). Both Chris Bortz and Jeff Berding appear to be on the fence, so let them know that your vote depends on them supporting this crucial investment in Cincinnati's urban core, and let the others know that their future political aspirations outside of City Hall depend on their support as well. If you would like to comment you should show up to City Hall 15 minutes early (meeting starts at 1pm) so that you can fill out a card to speak. If you are not quite comfortable sharing your story with members of Council, then simply show up to let them know that there is a critical mass of support for this project that won overwhelmingly at the ballot box this past November. If you are unable to show up at all, please contact members of City Council to share your thoughts.